Dolls are made there which is specialty factory and museum focuses on the history and art of making Thai dolls. It offers a charming slice of Thai culture. 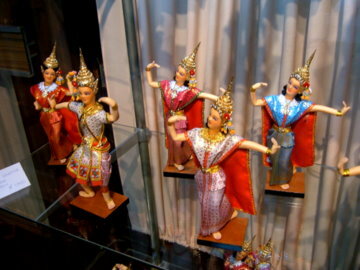 Why Bangkok Dolls Museum is special ? What to explore at Bangkok Dolls Museum? It has a small museum which displays a variety of dolls dressed in native costumes. You can see the craftsmen working at the shop as well. The second part of the building is the main “shop / showroom” area where you can see and buy the different dolls. The dolls are mostly the characters form the Ramakian and dolls in traditional Thai and Hill Tribe costumes. There are also traditional “baby type” dolls for children, and a selection of “Barbie” doll clothing outfits of beautifully detailed traditional Thai costumes. It is very marvelous to see the way in which the dolls are made and all the different processes and time involved in order to make just one doll. They also sell their handmade dolls at the museum and you will be impressed that the prices are pretty reasonable ranging from 150 baht for framed miniatures to 4120 baht for double dolls in a fancy case. How to get to Bangkok Dolls Museum? It is opened to public on Mondays to Saturdays from 8a.m. to 5p.m..
Bangkok Dolls is a little hard to find but definitely worth the effort! 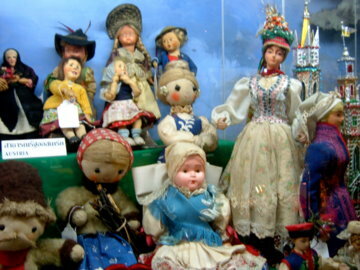 It has a small museum which displays a variety of dolls dressed in native costumes. You can see the craftsmen working at the shop as well. We went to purchase a Christmas Nativity doll set after being recommended to the shop by a friend. The shop had an incomplete set on display but the owner promised to have one made and sent to us in the United States. The package arrived a week or so after our return to the US and the set was shipped very carefully. We are delighted with the Nativity set and our visit to Bangkok Dolls! I walked from Kho-san road to here, which I would not recommend unless you enjoy walking (which I do) as it is quite a distance and you can get lost easily. I had to ask for directions a few times, but I find that locals in Bangkok are generally nice. I enjoyed the museum for what is was, it is small, but the collection is quite varied. I purchased a small picture, as I was travelling light, it has pride of place next to my other travel bits and bobs. I would recommend visting and not to be put off by the location. I used a motorcycle taxi (40b) to take me to the nearest sky train station afterwards (my legs couldn't take another hike) and the driver was friendly enough. We came for a visit and it was amazing. It's tucked away in a crappy area but its very interesting. Prices are very cheap for handmade dolls, we purchased one. You can see dolls being made, very smart! Get your taxi or tuk tuk to wait for you, also get their phone number and give to taxi or tuk tuk to call, no one seems to know where it is!